Based in Bath, our CCTV installation and support team are able to cover the South West of England, including Street, Glastonbury, Wells, Shepton Mallet and much more. Real solutions: Over the years, we have installed numerous CCTV system, to great success. Our installers work across the Bath, Street, Wells, Shepton Mallet area. "Over the years, we have seen great changes in the uses and features of CCTV systems. Now more than ever the technologies are offering new opportunities for capturing evidence. Speak with out CCTV installers and support team today to learn about the systems we can offer you." Ah, the dark days of 1942. As if it wasn’t bad enough that all those lovely, secure creature comforts we’re used to simply didn’t exist, you have the added issue of, well, Nazis. In ’42, Hitler’s hellish generals thought they were a shoo-in to win the war, and spent their time testing out V-2 rockets. But how does a collection of Nazis get a close-up view of these tests? Well, sadly, not by tying themselves to the unguided missile, but by using the world’s first CCTV set-up, courtesy of tech manufacturers, Siemens. That way, all those fascist fiends could watch, live, the rocket’s take-off on a black and white monitor thanks to an analogue camera. Welcome back to the present! Yep, we’re bang up-to-date now. But where are we at with our CCTV technology? In just a few short years since the advent of DVR, we’ve come on with leaps and bounds. These days it’s entirely possible to hook up a professional CCTV set up so that it streams images not just to your TV, but also your computer, tablet and smartphone. 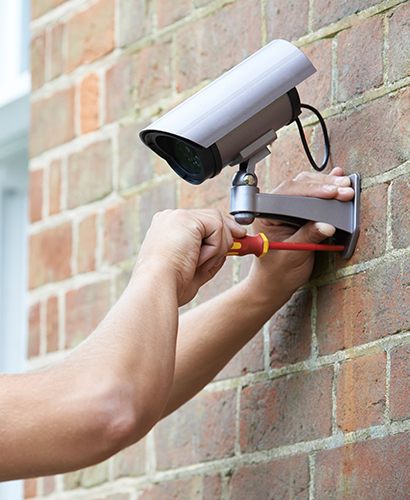 Fancy setting up your own security measures, for both commercial and residential premises? Then we can help – after all, we offer awesome security services in Bristol and beyond. Simply contact our team on 01225 800 602 and we’ll be delighted to discuss your individual requirements. It wasn’t for another thirty years or so that CCTV really took off. In part, that was thanks to the arrival of the now much-maligned VHS technology, which allowed owners to not simply watch monitors, but record images that could be used as evidence in criminal cases. You can add to that that development of the multiplexers – which means that rather than having one person watch one screen, users could switch, at will, to multiple camera feeds on a single screen. That meant far more coverage, without taking up as much space as would be required by having individual monitors for individual cameras. You can almost see that bright, digital future now, right? 60 years after the initial use of CCTV, we’d reached a whole new level. Not only had costs come down, meaning the tech wasn’t limited to banks and councils, but the technology itself had changed. Rather than relying on grainy VCR images, CCTV swapped the old format out for DVR. This meant that storage space for CCTV tapes wasn’t required – instead, footage could be captured and saved direct to a digital format. Much easier and much more secure.